The Renaissance Automatic Tissue Processor (Ventana) can handle up to 350 tissue cassettes per run using any of 13 independently programmable user defined protocols. Performs fixation, dehydrates, clears, and inflitrates with paraffin overnight. Completed samples can be independently oriented and embedded in paraffin blocks using the Leica EG1160 Paraffin Embedding Center. Minimal training is required to operate the tissue processor and embedding center. For an additional fee, imaging facility personnel can be hired to operate the equipment. To insure availability, please make a reservation on the imaging facility calendar. If you need to cancel, you must notify imaging personnel before your scheduled run. The Shandon Consul is a self-contained automated coverslipper, capable of coverslipping a maximum of 48 slides in less than 3 minutes per run. The coverslipper can be adapted to use coverslip sizes ranging from 22mm square to 24x60mm square, #1 or #1.5 (0.08-0.18mm) coverglass. The coverslipper is only available for slides requiring xylene-based mounting media. This coverslipper minimizes xylene exposure with an integrated activated-charcoal filter. Designed for fully motorized sectioning of paraffin and resin-embedded specimens. Sectioning thickness is adjustable from 0.5 – 100 microns. The Coarse Advanced Wheel allows manual adjustment of sectioning thickness. The AUTOLOAD feature allows the user to save a ready position for quick block switching. Can be operated by trained OMRF, OUHSC, or VA personnel. Use of this equipment requires training from a member of the imaging facility staff, or be able to demonstrate previous microtome experience. This fully automated rotary microtome has both a low profile disposable knife holder for paraffin sectioning, and a tungsten carbide knife for sectioning of resin embedded material. It is capable of routine sectioning between 3 – 50 microns. Use of this equipment requires training from a member of the imaging facility staff, or be able to demonstrate previous microtome experience. 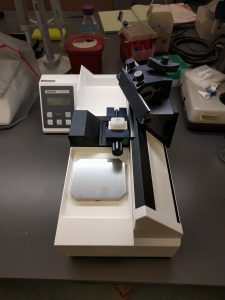 This fully automated rotary microtome is equipped only with a low profile disposable knife holder for routine paraffin sectioning (3-50microns). 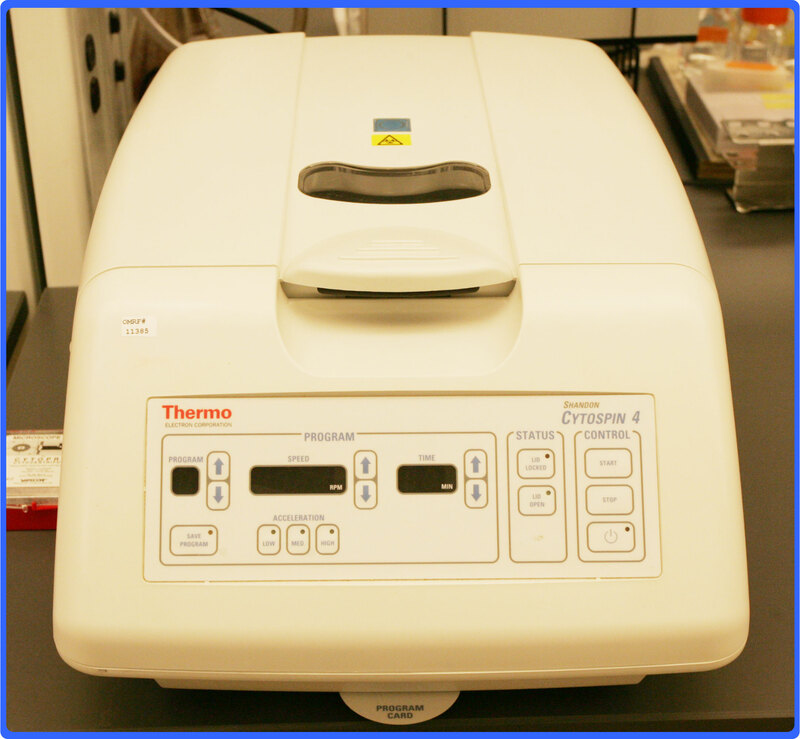 Use of this equipment requires training from a member of the imaging facility staff, or be able to demonstrate previous microtome experience. Gain all the advantages of the ultimate thin-layer cell preparation system with the Thermo Scientific™ Cytospin™ 4 Cytocentrifuge. 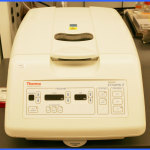 This reliable benchtop centrifuge provides economical thin-layer preparations from any liquid matrix. The Microm HM 440 E Microtome is an ergonomically-designed sliding microtome that guarantees superior performance with its high functioning and advanced features. It employs state-of-the-art electronic control systems and high-precision mechanics to achieve optimal section quality and reproducibility of even the most difficult-to-cut specimens. It can accommodate specimen sizes up to 80 x 60 mm, and can cut sections ranging from 1 to 100 microns. The HM 440 E Microtome also enables continuous upward and downward travel of the specimen through a motorized coarse feed system. This system employs three different speed settings and multi-purpose button control, allowing fast adjustment of specimen and knife edge distance. This fully automated cryostat has a fine orientation system to ensure high quality sectioning and consistant results. It can section fixed and unfixed tissues. Sample must be frozen and embedded in a freezing medium. The section thickness ranges between 0.5 – 300 microns on a specimen as large as 55 x 70 mm. Has programmable defrost cycles with a twin-compressor cooling system. Trained users are allowed to operate the cryostat. Performs cryofixation of suspensions, monolayer cell cultures and tissue. Fully automated with a one button operation. Freezes specimens up to 200 micron thickness and 2mm diameter without visible ice crystal damage. Does not require freeze protective additives. Real time temperature and pressure measurement digitally displayed. High freezing rate decreasing the resulting damaging crystal formation. Designed for rapid trimming of embedded samples and can be used for TEM, SEM, and Light Microscopy. Safer than trimming with a razor blade. Can trim samples as small as 0.2mm. Resin waste is removed by a vacuum cleaner. Glass Knife Breaker produces 45 degree knives from 6.4, 8, and 10mm thick glass. Designed for substitution and low temperature embedding of samples after cryofixation over a period of days. Fully programmable and customizable. Allows for UV polymerization of specimens in Lowicryl. Features Include rotary shadowing, carbon coating, heavy metal sputtering, glow discharging. This device is available to facility users for grid preparation.